Loud annoying alarm clocks got you down? Yeah, I know its actually the ever present foggy, misty, wetness in your car that the defroster can't get rid of. But for mornings when you don't really care that your alarm is ringing and you fight for just five more minutes of peace and slumber. You might as well be getting a foot massage while you ignore your morning wakeup. 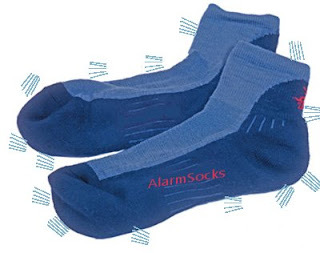 Introducing, Alarm Socks, another great technovation from the company that brought you that wicked cool google maps mashup that you can pull real-time information from within your car of traffic, maps, navigations, weather, local businesses, other vehicles supporting the common chatting service, picture swapping, and the mobile marketplace. In a recent interview with founder Peter Pants, Mr. Pants was quoted as saying, "With all the other great technology companies out there competing in the 'hyperlocal' sector, theres just nothing more local than your feet". There's no word as to whether or not Pants Industries, more commonly known as Eclectech:Technologies, thoughts, ideas... will still work on other hi-tech systems that involve coding, computers, internets, and users, but for now, we know that Mr. Pants will wake up every morning, and his feet will thank him.